Carp are not native to North American waters, but various carp species have been introduced here since the mid-1800s, much to the detriment of native fish. Although carp eradication measures have been active for over 100 years, long-established species, like the common carp, are present in almost every state. Asian carp (bighead, black, grass, and silver carp) were imported to the United States in the 1970s as a method to control nuisance algal blooms in wastewater treatment plants and aquaculture ponds as well as for human food. Within ten years, the carp escaped confinement and spread to the waters of the Mississippi River basin and other large rivers like the Missouri and Illinois. Asian carp are in direct competition with native aquatic species for food and habitat. Their rapid population increase is disrupting the ecology and food web of the large rivers of the Midwest. In areas where Asian carp are abundant, they have harmed native fish communities and interfered with commercial and recreational fishing. Experts are extremely concerned about the consequences of Asian carp invading the Great Lakes, where the carp would negatively affect the $7 billion-a-year fishing industry. 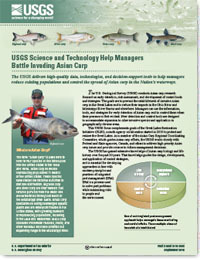 Kolar, Cynthia S.; Morrison, Sandra S.
Kolar, C.S., and Morrison, S.S., 2016, USGS science and technology help managers battle invading Asian carp: U.S. Geological Survey Fact Sheet 2016-3063, 4 p., http:/dx.doi.org/10.3133/fs20163063. 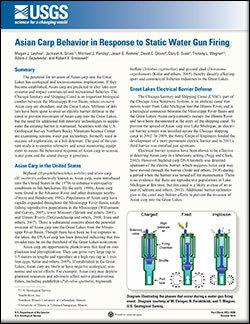 Layhee, Megan J.; Gross, Jackson A.; Parsley, Michael J.; Romine, Jason G.; Glover, David C.; Suski, Cory D.; Wagner, Tristany L.; Sepulveda, Adam J.; Gresswell, Robert E.
Asian carp behavior in response to static water gun firing; 2013; FS; 2013-3098; Layhee, Megan J.; Gross, Jackson A.; Parsley, Michael J.; Romine, Jason G.; Glover, David C.; Suski, Cory D.; Wagner, Tristany L.; Sepulveda, Adam J.; Gresswell, Robert E.
Neilson, Matthew E.; Fuller, Pamela L.
Neilson, M.E., and Fuller, P.L., 2017, The National Nonindigenous Aquatic Species Program (ver. 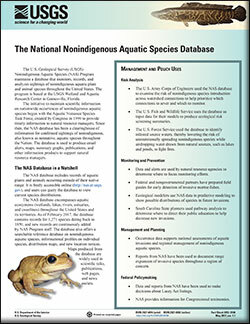 1.1, May 2017): U.S. Geological Survey Fact Sheet 2012–3100, 4 p., https://doi.org/10.3133/fs20123100. 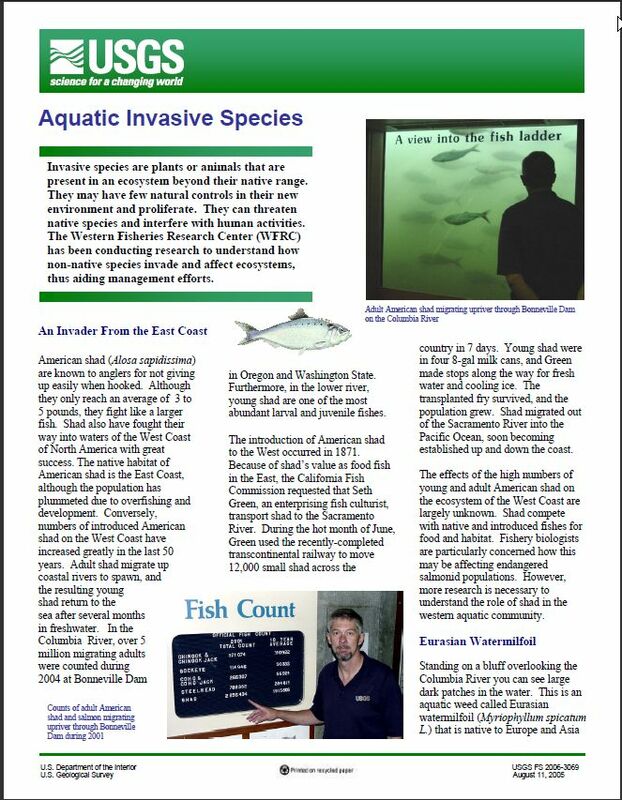 Facts About Invasive Bighead and Silver Carps; 2010; FS; 2010-3033; Chapman, Duane C.
Rodriguez, R.; Counihan , T.; Petersen, J.; Gadomski, D.; Becker, D.
If invasive bighead carp and silver carp spread into Lake Erie, there would be enough food available for these species of Asian carp to survive, according to a new study by the U.S. Geological Survey. Asian carp pose substantial environmental risk to the Great Lakes if they become established there, according to a bi-national Canadian and United States risk assessment released today. School of silver carp jumping out of the water. Mississippi Unit — MS student Chris Steffen tries to hold on to a record-size grass carp collected in an oxbow lake of the Yazoo River Basin, Mississippi. Josh Schloesser, a MS student at the Kansas Unit holding a grass carp collected while sampling with the USFWS on the Missouri River. Josh is working closely with the FWS and other agencies to develop sampling protocols for Missouri River fishes. U.S. Geological Survey scientists encounter Asian flying carp on the Yazoo River, Mississippi.